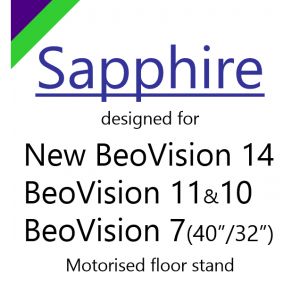 The Sapphire system is designed to attach to the motorised floor stand of the new BeoVision 14. Whether you are upgrading to the 14 or new to the BeoVision range, you can have that unmistakable uncluttered look that suits B&O TVs so well. Find out more information on Sapphire or head to the Sapphire Shop to specify exactly what you want. Indigo Lime is a trading name of Triple Link Manufacturing Ltd.
We are in no way connected to Bang & Olufsen or LOEWE.